My name is Amaury Mellier, I am a 23 year-old french student in Biology. I want to work in wild conservation by the research way and I am particularly interested by reptile conservation. I came in Belize for the first time three years ago during two months to learn about Crocodile conservation with ACES (American Crocodile Education Sanctuary). In this way, i learned a large range of information about the American Crocodile, unique species present on Ambergris Caye, such as protocol of captures, physiology, morphology and behavior. Last 21st of March i was so glad to come back for new adventures and i couldn’t have any idea about how dense it would be this time again. 3 story called me to mind and pushed me to testify about how bad is the situation between crocs and human on the island. The first one was on 2nd of April when i was doing a nesting survey and found some remains of a dead croc next to a rope. It is clear that some people introduced themselves in a controlled area to illegally catch and kill this croc. It was determined afterwards to have been close to 13 feet. 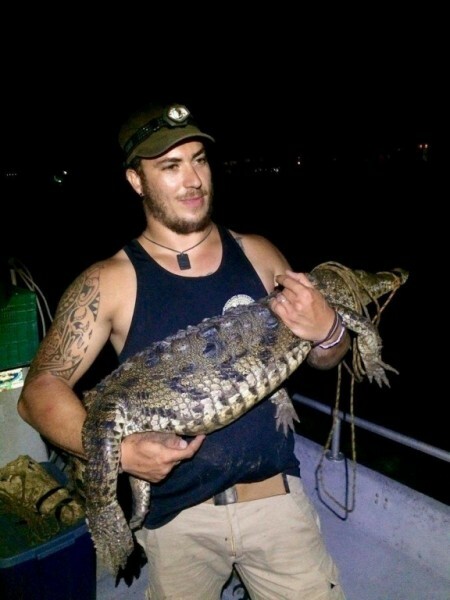 The second episode was two days after when we were trying to catch crocs for the scientific purpose of the association. A subadult came out of the water really quickly and with a very aggressive behavior, probably believing that we were here only to feed him because it is what happen usually in this area. The last one was a surgery that we had to do on a croc which was between life and death one month before and not healing well. Why a surgery ? Because this croc had been found with a fist-size hole in the neck because of the human hand, by fear or cruelty. Otherwise the poaching for commerce or the fear kills already enough croc per year, because people doesn’t understand how they need this species, in particular on the island. Those predators are on the top of the food chain and by this way controls all the other animal populations. No croc means more of those animals, and those one eat vegetables which would means a progressive destruction of the mangrove, the lagoon, about all that make this island what it is. Think about it twice before to buy a teeth of croc, throw chicken by the window in the lagoon or look for croc feeding illegally on a beach when you can ask whatever you want to ACES in natural conditions and safely. Thanks to Vince ROSE, Boss of ACES for his metaphor about the mouse. Thanks to Chris SUMMERS my budy, teacher and friend. Thanks to Christina MANZI, Dustin MINCER and Ryan ANCONA to give or have given their time to help ACES. The 2015 Ruta Maya River Challenge has begun!